Dr. Bob De Maria has been trained and tested in the utilization of nutritional and natural products and has focused his attention on seeking simple answers to tough questions. In addition to a chiropractic degree, Dr. De Maria has a bachelor’s degree in human biology, diplomate status in chiropractic orthopaedics, and a fellowship in applied spinal biomedical engineer- ing. He has taught in the legal, insurance, business, and health care fields throughout the United States and Europe. Along with The Natural Prostate Cure, this is our most popular health book. 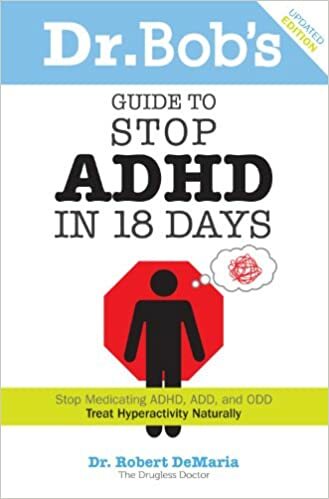 The ADD & ADHD Diet has sold over 100,000 copies with many readers sending us thank you notes. It is rewarding to know that we have helped so many determine the cause of an individual’s diagnosed condition as ADD. In most cases the illness had been misdiagnosed and was not ADD. We are thankful to authors Rachel Bell and Dr. Howard Peiper for adding this book to our success list. Nutrition-based therapies have been used effectively to treat a wide variety of health problems, ranging from PMS to cancer. In this helpful guide, clinical nutritionist Zimmerman discusses how diet therapy can provide long-term relief and even a cure for attention deficit disorder (ADD). During the past decade, the use of Ritalin, the drug most commonly prescribed for ADD, has risen 600 percent, but its effects are temporary and possibly harmful. Zimmerman’s program for getting off medication involves eliminating allergic foods, additives, pollutants, and harmful fats and instead focusing on unprocessed, nutrient-rich meals supplemented with fatty acids, minerals, and vitamin co-enzymes. Her 30-day plan provides food charts and recipe ideas. This effective, natural approach, based on extensive research on the link between diet and brain function, will be greatly appreciated by parents of children diagnosed with ADD. Highly recommended for public libraries.